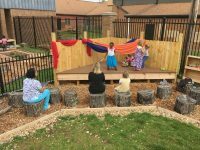 Keystone Learning Academy’s natural playground was built in a day by a community who came together to make the children’s dreams a reality. The journey started with a vision to become a Reggio Emilia inspired child development center. 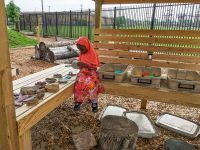 The entire center was undergoing a transformation, creating an environment in which children are seen as competent and capable and adding natural, loose parts to the classrooms. The next step was to take these principles outside. During a classroom study about natural playgrounds, the children were asked what they might like on their playground. At first the children had trouble dreaming about what a natural playground would look like and asked only for traditional equipment like the ones that had just been removed. 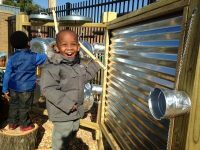 Keystone is located in the heart of an urban neighborhood of Louisville, Kentucky and the children have little exposure to natural spaces. 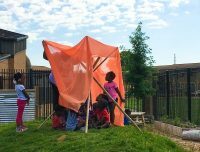 To deepen their vision, the teachers planned a field trip to a natural playground at St Francis School, a preschool in a rural setting. The St Francis children invited their new friends to roll down a hill with them, but having no experience with the art of rolling, the Keystone children only scooted, feet first. Following the trip, the children’s wish list changed dramatically – trees to climb, a hill to roll down and “lots of sand” to dig in. 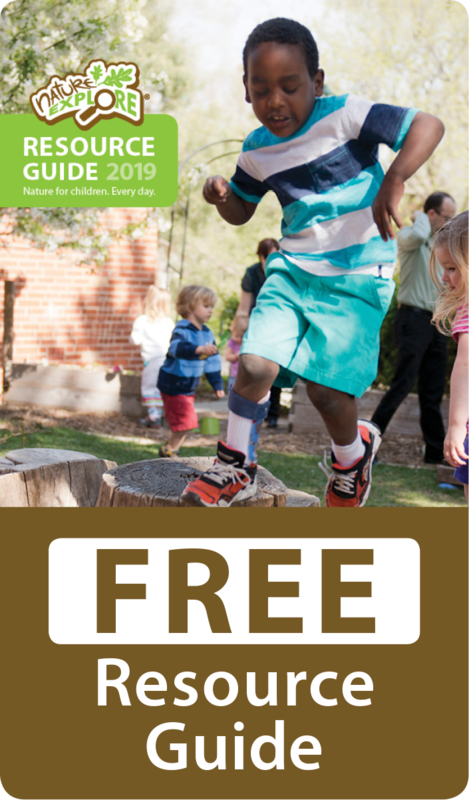 Wes Worley donated his time and skills to create architectural plans based on the children’s playground designs and the concept plan created by the Nature Explore program. Through Metro United Way’s Volunteer Connection Center and GE’s ongoing commitment to building better communities, a huge volunteer effort by GE Appliances created earth features, planted sod, ran water lines as well as built onsite and installed garden beds, storage, tables, climbing structures, and an entryway, all in a single day. 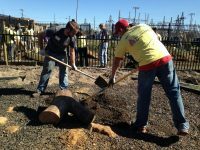 In addition to building the playground, the over 500 GE employees revitalized the surrounding neighborhood. 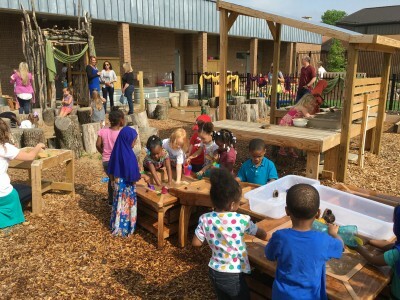 Other community partners included Community Coordinated Child Care (4-C) who served as advisors and co-planners for the project and Bernheim Arboretum and Research Forest who offered expertise and donated trees through their Children at Play Initiative. Keystone’s natural playground features a small hill, a stage for performance, a music wall, a water table, a triangle of stacked logs for climbing and jumping, a building area with tree cookies and other loose parts, a bike path, garden beds for flowers and vegetables, native trees, a sand and dirt digging area surrounded by rings of tree stumps for climbing and balance, an art area, an entryway constructed of limbs and one of the children’s very favorites, a mud kitchen complete with running water. To celebrate the completion of the project, the children of Keystone invited their St Francis friends to visit the playspace and roll down the new hill together. Keystone Learning Academy is a part of the Excellence Academy, a program possible through a partnership with Metro United Way, Community Coordinated Child Care (4-C) and the Lift a Life Foundation. 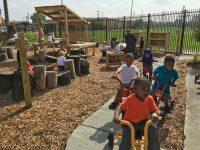 The natural playground was generously funded by the James Graham Brown Foundation.